The Folklore Museum housed on the first floor of the palace also has a wide range of household utensils including wooden kitchenware, brass/copperware etc. representing the lifestyle of the Keralites during different periods. Thaliyola (old manuscripts), Chilambu (a sort of anklet) used by Umayamma Rani and Maravuri (dress material made of the bark of trees) etc. are well preserved here. Oorakkudukku a device for intellectual exercise used by the Yogis as a pastime, Gajalekshmi – a lamp representing the Goddess of prosperity – Lakshmi, seated on her elephant (this lamp is usually lighted at dusk and during the harvest season to welcome the goddess) are other interesting exhibits. The Kettuvillakku – a ceremonial lamp (artistically made out of coloured paper and locally available light wood splits/rails), lit during festivals at the Bhagavathy temples of Southern Kerala; a model of the most impressive of Theyyams – the Muthappan theyyam, a Patayani kolam model; the headgear and dress used by Ottanthulal artistes exhibited here give an insight into the performing as well as the ritual art forms of Kerala. 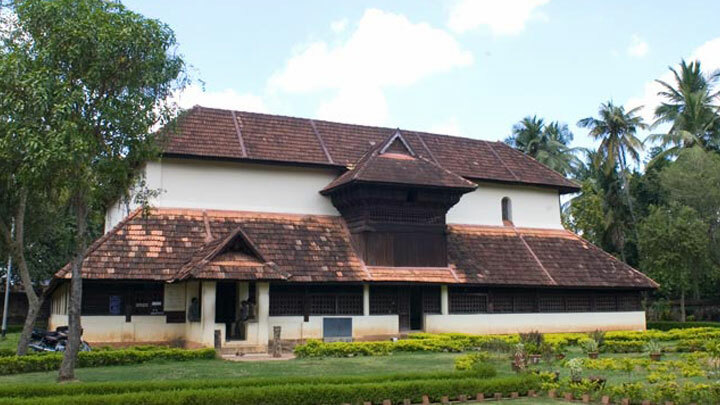 The Numismatics Museum at the Koyikkal Palace is the only one of its kind in the State. Occupying the ground floor of the palace, the coins displayed here belong to different parts of the world as well as to different periods. This rare and historically valuable collection is a vestige of the trade relation of Kerala in the bygone ages. Among the exhibits are some of the oldest coins of Kerala – Ottaputhen, Erattaputhen, Kaliyugarayan Panam etc. A Venetian coin named Amaida, believed to have been presented to Jesus Christ, is also a property of this museum. The most valuable among the Indian coins found here are Karsha. These are nearly 2500 years old. Rasi, the world’s smallest coins are also on display here. Sreekrishna Rasi, one of the rasis (regional coins) issued by the local kings of Kerala around the 10th century,Anantharayan Panam – the first modern gold coin of Travancore in circulation in the 15th and 17th centuries, Kochi Puthen – one of the coins of the Kochi Kingdom which also had variations like Indo-Dutch Puthen (1782 AD). Lekshmi Varaham – the silver coins minted in Travancore,Rasi Palaka (the coin board) – a wooden board with small niches used to count small coins (counting up to 100 to 200 at a time), coin mints etc. are preserved here. Nearly 374 Roman gold coins, each worth up to five hundred thousand rupees today, depicting Roman Gods and Goddesses like Venus, Hercules, Mars, Ceres, Genius, etc. and rulers like Hardin (AD 117 – 138) are also among the collection. The museum also has coins used by various Indian dynasties – the Gwalior royal family, the Nizam of Hyderabad, Tipu Sultan, Hyder Ali, etc. Visiting hours: 0900- 1700 hrs on all days, except Mondays.